An observatory may not be the first place that comes to mind when planning your wedding ceremony, but the Mount Wilson Observatory overlooking the city of Los Angeles could change all of that. 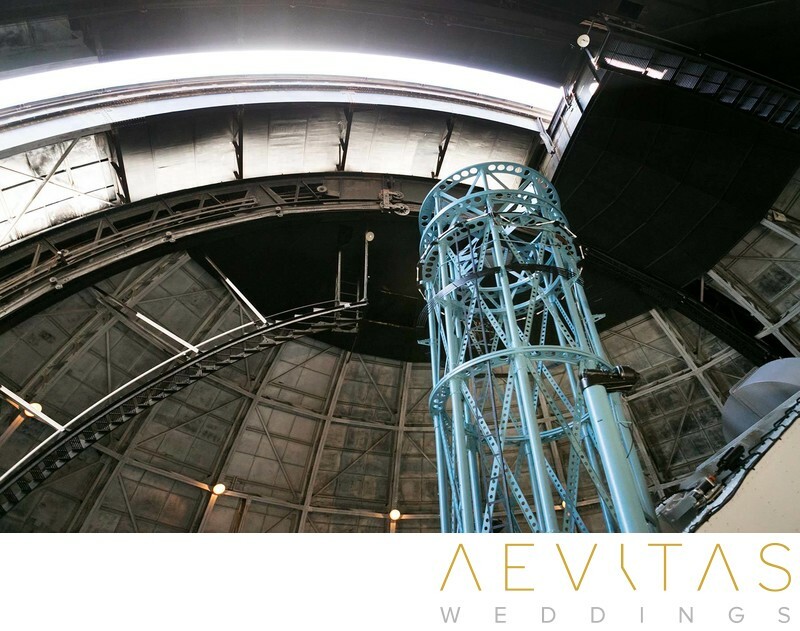 With its state-of-the-art telescopes, astronomy equipment and captivating industrial-style interior, having your wedding at the Mount Wilson Observatory makes a strong statement. It’s around 45-minutes drive up to one of Southern California’s highest mountains to the Mount Wilson Observatory, with the drive there being an adventure in itself. Your guests will be treated to outstanding vistas across Los Angeles, while being in the presence of one of the early 20th century’s most pioneering astronomical facilities. Wedding ceremonies are held within its dome-shaped architecture, backed by the original solar and night-time telescopes that were once used by some of America’s most famous astronomers (including Harlow Shapley and Edwin Hubble) during their most important findings. For couples with a love of astronomy and the night sky, exchanging vows in such a prestigious venue pays tribute to this shared interest. The metallic stairwells, barriers and astronomical equipment make the perfect backdrop for dramatic couple portraits after your ceremony, while the Los Angeles city panorama is idyllic for bridal party portraits and family formals during the late afternoon light. Wedding ceremonies at the Mount Wilson Observatory are ideally suited to more intimate celebrations with just your closest family and friends as space is limited inside. Their on-site Cosmic Cafe is available for lunch-time receptions, although most couples opt to hold a more lavish affair at an alternative venue or Los Angeles-based hotel. Despite the travel times that need to be taken into consideration when planning a Mount Wilson Observatory wedding ceremony, the lasting impression of your nuptials and unique wedding photos will make it more than worthwhile.